The Catalan Association of Jews and Palestinians (JUNTS), the International Jewish Anti-Zionist Network (IJAN) and the Human Rights Institute of Catalonia together welcome the declaration of Barcelona City Council on 19th April in defence of respect for human rights and international law for the Palestinian population, with the support of the political groups Barcelona en Comú, Esquerra Republicana de Catalunya, Partit Socialista de Catalunya and Candidatura d’Unitat Popular. This is a first step towards respect of human rights and international law and enforcement around the world. This declaration states that any human rights violations committed by states, organizations or enterprises anywhere in the world will be taken into account in procurement processes. Barcelona will put an end to its complicity with human rights and international law violations. The declaration expresses deep concern for the constant violations of these rights by Israel in Palestine, by its institutions and enterprises, and also by companies directly connected to these violations, whether in Palestine or anywhere else in the world. The declaration also recognizes the legitimacy and the right of nonviolent initiatives and campaigns promoted by Palestinian and international civil society to defend respect for human rights and international law in Palestine. It also expresses a commitment to protect freedom of expression and freedom of association. We are deeply concerned about the article that was published in the La Vanguardia newspaper on 26th April which stated that the “Jewish community” detects “traces of anti-semitism” in this declaration. We would like to clarify that there is not one Jewish community, but a wide variety of Jewish communities. Judaism and Jewish identities embrace a wide variety of religious and secular groups, and a strong and varied body of traditions, cultures and experiences. The organizations the article refers to are specific religious communities which do not represent the opinion of other Jewish people. The IJAN and JUNTS communities have a different opinion and we have published this manifesto to support the declaration of Barcelona City Council. We do not feel represented by the above-mentioned communities or by their statements. We are concerned about the tendency to denounce any criticism of Israel’s Zionist policies as antisemitic. This is a trivialization of anti semitism, which makes it more difficult to understand, which is counterproductive, and which makes it harder to fight against. Anti-semitism must be pursued, just as any other type of racism. We understand anti-semitism as a form of discrimination, violence or stereotypes of Jewish people for the mere fact of being Jewish. Anti-semitism has historically expressed itself in structural inequality, expulsion and genocide, the most well-known example being the Nazi genocide in Europe. Israeli people are the citizens of Israel, most of them Jewish, whether secular or religious. They hold a wide variety of political views, including anti-zionism, and also many different religious identities. The state of Israel was created under the Zionist ideology, based on exclusive nationalism and settler colonialism. It was promoted by the colonial powers of the time, and led to the expulsion of half of the Palestinian population in 1947 (750,000 people), as Israel was founded. The descendants of these refugees still live in exile or in other parts of the country. Israel has countless laws that discriminate against the non-Jewish population, who are mostly Palestinian. This is a clear example of segregation or apartheid, the term used in South Africa. This is why Jews in JUNTS, IJAN and other organizations are against Zionism, which is the root of Israel’s racist and colonial policies. Therefore, being anti-zionist is being anti-racist. To criticize Israel is a democratic right, the same as it is to criticize any other state. To fight against anti-semitism is also to condemn how imprecise or deceitful definitions of anti-semitism have a negative impact on movements for justice. These arbitrary, superficial definitions are often used to defend Israel’s policies while creating Islamophobic discourse around the world. 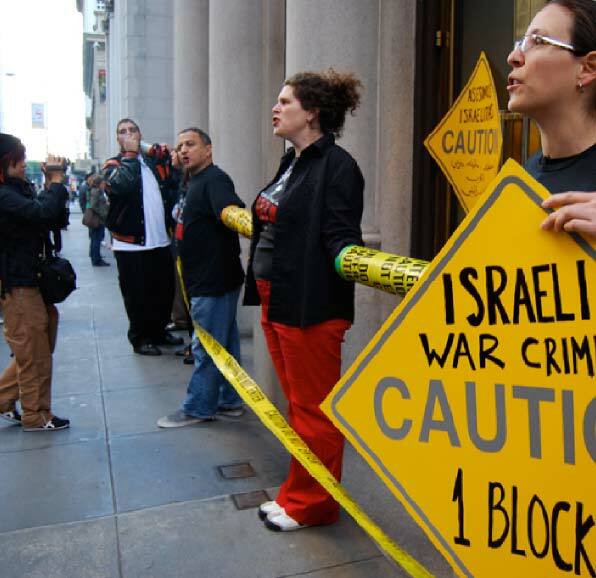 The campaign for Boycott, Divestment and Sanctions (BDS) is an anti-racist, non-violent campaign launched in 2005 and led by Palestinian civil society. The campaign calls for boycott, divestment and sanctions against Israel and its institutions, and against companies which profit from the occupation and colonization of Palestine. This is a call to international civil society that will continue until three demands, which are based on international law, are met: the return of lands occupied in 1967 and the destruction of the Wall; guarantee of the right of return for refugees; and ensuring equal rights for Palestinians who live in Israel. BDS is a non-violent tool which we fully support and we actively participate in. Accusing those who promote respect for human rights of anti-semitism is counterproductive and trivializes real anti-semitism. In the light of the rise of extreme rightwing political parties and movements in Europe and United States, we should be concerned about this. This is why the signatory organizations will not be complicit in the instrumentalization and manipulation Israel makes of some Jewish communities around the world in order to justify systematic colonial policies and illegal occupation. As Jewish Voice for Peace says, “Never again for anyone” refers to all humanity. Never again for anyone means we must be inspired by our stories and hold firm against all types of discrimination. This is why we are calling for unity in defence of human rights and international law, as a mechanism for the decolonization of Palestine, and to allow free societies to grow in Palestine and everywhere in the world.